I appreciate those that are grieving for a good mother, and I am happy that was their life experience, but for many of us, this is just not true. Sometimes, I even find this to be the theme emphasized on the MDM website and Facebook page as well, because we have classes that help daughters who had a good mother and who are on their journey of grieving. However, for those of you who may not have a good relationship with your mother or do not have fond memories about her, there is another side of the Motherless Daughters Ministry. We have classes and support for you as well! Many women have not experienced a good mother. Many women have been very hurt and have struggled all their lives just to make it through each day. There was no unconditional love, and no instruction or direction on how to make it through life, everyday chores, and relationships. Some mothers took care of physical needs but completely neglected emotional needs. Because of that, they were never able to relate on a deeper level. The Motherless Daughters Ministry offers a class called, “The Emotionally Absent Mother.” In this class, you will meet people who feel just like you do. You will meet people who have been through what you have been through and/or are going through. You will meet people who understand and you will realize you are not alone. You will learn that it is okay to feel the way you feel about your mother. You will be supported and loved just where you are. You will have the opportunity to share your heart through exercises and discussions with women who you can relate to, so you can start or continue your healing. You will be helped! 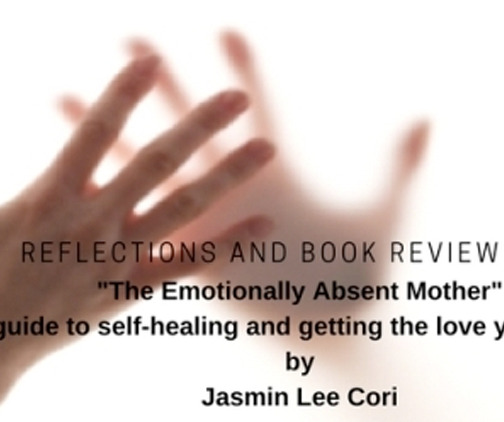 Jasmin Lee Cori states in her book, “No one escapes wanting a mother’s love. Few experiences in life are as deep as the feelings we carry about our mothers. Yet, many of us are secretly unsatisfied with what we got from our mothers, resentful that – whether their fault or not—they failed to provide important aspects of what we needed. And we’re paying the price. When Mother is not doing her larger-than-life job as it needs to be done, children have significant deficits in their foundations.” This is the foundation we begin from. In “The Emotionally Absent Mother” class, we combine chapters of the book to highlight what is essential for healing an Emotionally Absent Daughter. Chapter 6: Examines the “voices of the under-mothered” and what makes them so. Chapter 2: Takes some concepts deeper by talking about the various roles that the Good Mother plays in a child’s life. These roles are attuning and responding to the needs of her children, teaching her children to effectively manage their emotions, helping her children feel “seen,” encouraging her children, giving support and guidance through mentoring, protecting her children, and being a Home Base for them to come back to. Chapter 3: Is about attachment, which is a reflection of the strength and quality of the mother-child bond and the effects of secure or insecure attachment that follow us all the way into adult life. This chapter also helps you discover your personal attachment style. Chapter 4: Gives us 9 building blocks that make us who we are, such as a happy home and a sense of belonging. Chapter 5: Transitions to what it is like when mother leaves a hole in the heart where she was supposed to be. This chapter describes the emotionally absent mother, the reasons for her absence, and how this is experienced. Chapter 12: Helps you get a more objective picture of your mother by doing an exercise entitled “telling your mother’s story” and writing yourself a letter from the “good” mother. Chapter 7: Begins the discussion of healing by discovering the wound, working through your feelings and leaving the past. Chapter 11: Takes a more current-day, proactive approach by looking at developmental needs that were not met earlier and talking about practical strategies for meeting them. To help you see the connection between the mothering you experienced and the difficulties in your life. To provide suggestions for how these missing elements can be made up for now.